Following on from our interview with David Makin who coded Crystal Dragon and Super Scramble Simulator we have now had the pleasure of interviewing Andrew Morris, who was involved in creating the graphics for Super Scramble Simulator as well as the graphics on some of the great Gremlin / Magnetic Fields games including Super Cars and Lotus Espirit. You are credited as the graphician on Kid Chaos, Lotus, Super Car et.c. - Did you always specialise in computer graphics or did you ever try programming or sound sampling or writing game music? I was also designer on the games you mentioned. I did a bit of everything in the early days, as most did, but when things became more specialised and professional, I moved into design. Was the Amiga the first computer you worked on commercially? Before the Amiga, I worked on all the popular 8-bit platforms on games such as Kikstart II and Super Scramble. Did the Amiga specs make graphics work more interesting in that you could add so many more colours and bitplanes, or did it just make the work harder? 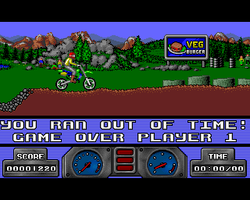 The Amiga allowed for a significantly wider range of creativity and realism. 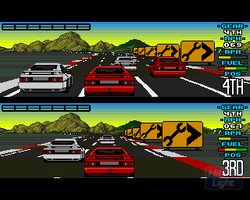 Much of the 8-bit graphics should be viewed in the context of the limited technical ability available. 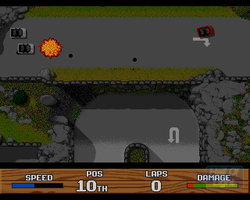 The Amiga made it possible for graphics to open up, particularly in artistic style and visual immersion. Super Scramble Simulator had incredible graphical detail and polish, and you must have put a lot of effort into it. How long did it take you to get to grips with the new Amiga system and produce this game? Was it fun? We had an 'original' model Amiga in the office for about a year before we started developing for it (the market was initially quite small). I found it hugely exciting and I worked on it a lot in my spare time. It offered so much scope for creativity, with a huge colour palette and a much higher resolution. Before I did Super Scramble, I worked on a game called Wrangler, which was an update of a game we did on the 8-bit platforms called Rollaround. I loved working on Super Scramble and was very pleased with the final result - although I wish we'd made it a bit easier to play. Were there limitations placed on your graphic work by the programmers? The graphical limitations were more a result of the technology than the programmer. Shaun (Southern) was, and still is, one of the best programmers in the business. We worked hard together to overcome problems, e.g. making the 3 colour backgrounds in Kid Chaos appear to be closer to 100 colours using clever tricks and bespoke utilities. During game development (Lotus, Kid Chaos, Super Cars, Super Scramble Simulator) did you have total free control over the graphic look of the game or did you have to work to a pre set look? I had complete freedom within the constraints of the hardware. Which computer graphic tools did you use? I used custom utilities, Koala Paint (C64) and DPaint. Why is Deluxe Paint held in such high regard by Amiga graphic artists? DPaint did everything you needed of an art package and was the standard. What was the process of creating game sprites - were they drawn by hand first - amended and then transfered to computer ? There was no standard way of creating sprites, different methods were used. Did you take any inspiration from other Amiga games when creating your games graphics? I can't really think of anyone. Our games were often plagiarised - Lotus was obviously the inspiration for the Jaguar game, even copying our fog effect. The Alfa Romeo SZ was obviously an inspiration behind a car which appeared in both Supercars 1 and 2. Did you have access to one of these cars or did you just design it from images in a magazine? The cars were inspired by those seen in magazines. In addition to the Alfa, the Honda NSX and the something called the Cizeta Moroder V16T also offered inspiration. We had to wait until Lotus before we had access to real cars. 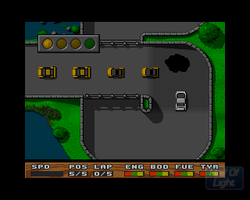 The communications screens in Supercars 2 are often said to be some of the most detailed graphics on the Amiga, with the characters on the Police screen in particular looking almost digitised in their detail. Were these lovingly drawn from photographs or simply scanned and manipulated? The first scanner we had was bought for Rally Championship. Up until that point, everything was copied from various sources. Do you have any memories of the Amiga Public Domain scence e.g. the demos - utilities - games? I used to love the Amiga PD scene and am pleased to see a lot of it on YouTube now - the Thrust band, etc. It offered a unique creative outlet and the people involved were genuinely talented. I notice some recuring characters in your games - such as the crowd standing by the high score table in Super Scramble Simulator and the ones standing around the car in Supercars 2. Did you base these on family and friends and did you make any cameos in the games yourselves? The crowds were usually just people from magazines or catalogues. I think some of them were reused and adapted. I liked to use people because I though they brought a bit of personality to the games, which often seem a bit soulless. It was about creating an atmosphere. I think there were a few cameos. Shaun and I definitely appeared in Super Cars International! Bagley Marsh is often featured in your driving games and is a real circuit in Shropshire. Did you guys use the circuit or just know about it? I'd actually forgotten about that. I think it was just put in there for fun, we certainly didn't copy it. In Super Cars II, Nancy Allen was one of the news readers (in name only), the actress who appeared in Robocop. We always put in a lot of hidden references, screens, cheats and games - for fun, more than anything. If you clicked on the sky in Super Cars, it brought up a screen about the ozone layer. How did the team choose which genre of game to make - was it based on what appealed to the team or did you base the decisions on what was selling well at the time? I always wanted to design games I enjoyed playing, and they were mainly racing and platform games. Turning to the Lotus games, did you get any special access to any Lotus cars during the making of those games or was it all done with press packs and still photos? We did get access to the cars with Lotus. I visited their Liverpool dealer for the first game but later got to drive an Esprit at 140mph on the race track, and was also driven sideways by a Lotus test driver, when the game was launched at the Lotus factory. Something similar happened with Lotus 2 and the Elan. The launch was at Millbrook Proving Ground, which has a high speed banked circular circuit (often seen on Top Gear, etc.) on which we took the Esprit, and a twisty road, where the Elan was driven. For the third game, I worked from photographs, as the new car was a concept. Rumour has it that Lotus Plc. were so happy with the game they set up an Amiga in the voyer of their Lotus Group HQ in Norfolk where visitors could play it. Is this true, and did you get any other perks from Lotus for your efforts? Lotus were very pleased with the games and I think did have it available to play at their HQ. There weren't many perks, although I think we were offered 10% off a new Lotus. Years later, I bought a Lotus Exige, on which I negotiated a 10% discount. After Lotus 3, Magnetic Fields seemed to take time off before coming back with Kid Chaos. Why did you move away from Gremlin and what was it like working for Ocean? Was it a happy relationship? Although I had a few travelling stints around Asia, we really didn't take any time off after Lotus III, and went straight onto Kid Chaos, which was designed for the Amiga, with an upgraded version for the more advanced CD32. It was such a huge game that it took 2 years to complete - the same as all three Lotus games put together. Gremlin thought it was too similar to Zool, so we spoke to other publishers and Ocean offered the best deal. I remember when they first saw it, a huge crowd gathered around. Someone said, "it's the best thing I've seen on the CD32, but what is the Amiga version like". I replied, "this is the Amiga version". Ocean would later publish Super Cars International for us. Is it true that the flowers in Kid Chaos were orginally supposed to be something else, and had to be changed because Ocean thought the game was 'too violent'? 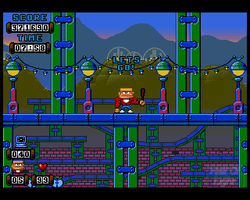 The game was originally to be released as Kid Vicious. There had been a lot of fuss in the news papers about games being too violent, so the name was changed to Kid Chaos. The flowers were always flowers - that was the first level I designed. The character was also changed - I can't remember why - from a cat: Cosmic Kitten (also the original working title). Rumour has it that the original 16-bit 'Top Gear' trilogy was created by you guys before being passed to other developers. Did you have any involvement with the Top Gear games at all? 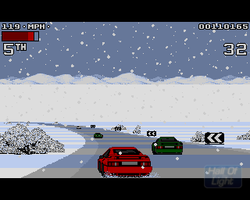 We didn't have any involvement in Top Gear but it was often remarked on how similar the two games were. They even had the same music! I read on the Wiki page that Magnetic Fields have made all their 8-bit titles Public Domain. Is this true and do you think any 16-bit titles will go the same way? We originally said that we did not mind our games being swapped on the Internet, as long as no one was making any money from them. More recently, we have been working hard on versions for iOS, Android, etc. Kikstart and Kikstart II have actually been available on the iPhone via the Commodore 64 emulator for some time. We hope to re-release other titles in the near future. I have been approached by a few people about the Wikipedia page and hope to help someone update it soon. Are you still involved in the computer industry today - if so are there any projects you can tell our readers about? My last game was Mobile 1 Rally Championship on the PC. Following that, Shaun and I set up Eugenicy, which had agreed terms for the licencing of a major motoring brand but struggled to get the backing to fund it. I then left the industry to pursue other interests. Shaun is still involved in the industry, running Team 3 Games. I'd like to thank everyone reading this interview for their continued support over the years. I do try to reply to the emails and messages that I receive - they're always appreciated. The games we designed would be nothing without those who bought and played them, and who continue to show their support on the many websites, not to mention the hundreds of videos posted on YouTube. The time and effort people have given and continue to give in showing interest in and documenting the history of our games makes me proud of what we achieved and pleased to be part of an industry, which is so fondly remembered. AmigaPd would like to thank Andrew Morris for taking the time to answer the questions AMigaPd would also like to thank the Lemon Amiga forum for providing some extra questions, especially Lifeschool.